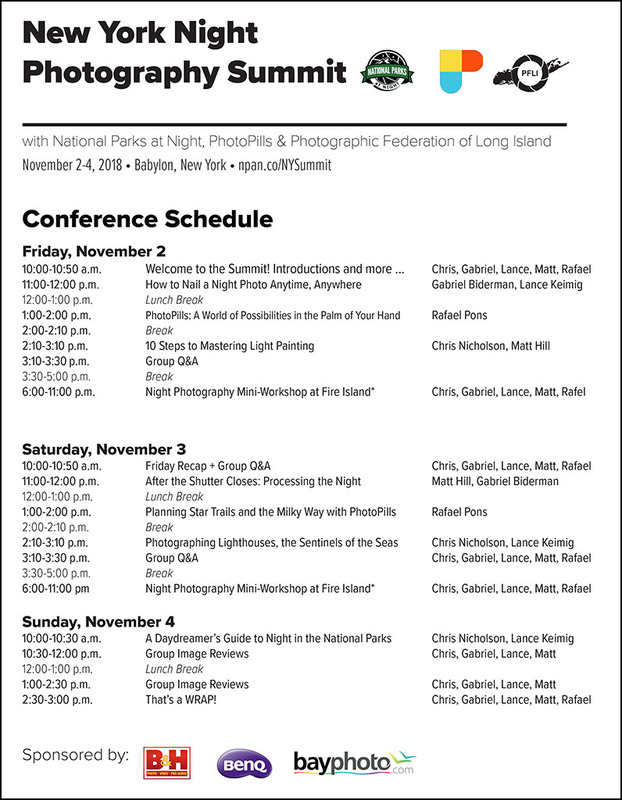 Join National Parks at Night, PhotoPills and the Photographic Federation of Long Island for a three-day weekend intensive of all things night photography! All of this made possible in part by our sponsors who are eager to meet, assist and work with everyone who attends: by BenQ, B&H Photo and Bay Photo Lab. Learn from five night photography experts about the ins and outs of long exposure, shooting in the dark, and scouting and planning a landscape photo shoot. Join all five instructors for night photography excursions at Fire Island National Seashore and the iconic Fire Island Lighthouse. Limited number of mini-workshop tickets are available for each night. Available only to Summit attendees. Click schedule at right to see full version.